There’s probably an argument raging somewhere as to who recorded the definitive version of this track. The main contenders are Carlos Santana and Peter Green – heavyweights all – but both versions are different enough to be worthy in their own right. Santana’s instrumental rendering is a classic example of his playing at that time: urgent, Latin-influenced blues-rock. Peter Green’s version of Black Magic Woman is in an almost completely different mould: just listen to the rhythm part -straight out of The Shadows’ era. But whichever version takes your fancy, Peter’s is the one up on the workbench, so let’s have a look at the critter in detail. If we split the song up into two sections, it’s probably fair to say that it might be the rhythm part which gives you the most sleepless nights. If you’re not used to playing this kind of constant patterning, you’ll have to spend a little time in the company of a metronome or drum machine. Work on the right and left hands individually: get the chord shapes sorted out with the left hand and then concentrate on the picking pattern. When you’re comfortable that both are working nicely together, set your drum machine/metronome to a fairly slow tempo and try to repeat the chord pattern. When that sounds like it’s working, turn up the speed until it reaches the song tempo. Then, all should be well. Recommended to use Telecaster-style guitar. We figured that this type of rhythm part cries out for that old Fender sound. Make sure that you can control the ‘shape’ of the rhythm with the right hand – you’ll almost certainly need to mute the strings at some point in order that everything stays well-defined. If you’re beginner or not familiar with guitar terminology, please visit our dictionary. The lead part is another fine example of Peter Green’s sense of economical expression on the guitar. We’ve looked at his work many times in the past and always come to the same conclusion – Peter had a classic sense of taste and phrasing. The fills in the verse section of the tune are all worthy of your attention, so don’t skip one of them. Novices would do well to make each of these licks an independent study – they’re priceless introductions to blues playing. The solo will take a couple of things to make it sound just right: an amp with reverb on it is a good start, but that in combination with a Les Paul (or at least something equipped with humbucking pick-ups) would be the closest match. As legend has it, Peter’s own Les Paul (now in the hands of Gary Moore) had a unique sound when switched to the ‘central’ pick-up selection. Owing to apparent phase cancellation, this setting produced an unusually sweet, hollow sound which is extremely hard to reproduce in any other way. It’s not worth messing with your guitar for just one or two numbers, but it’s worth bearing this in mind when setting your amp to play this piece. The solo itself is quite modestly paced, but pay particular attention to those string bends and that classic vibrato – both are essential for the Black Magic Woman to happen! 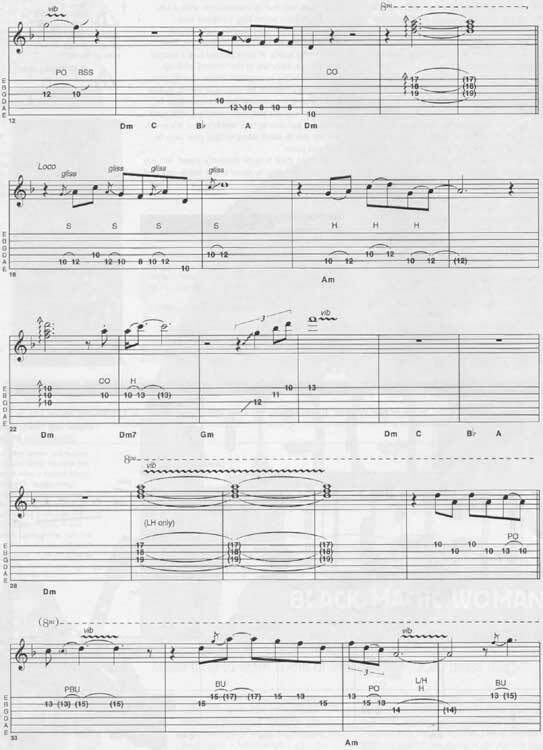 It’s just a part of Peter Green Black Magic Woman guitar tab and sheet.